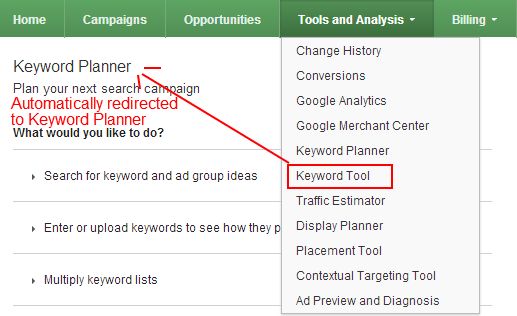 Frederic Chanut shared on Google+ an interesting Google AdWords bug with the keyword tool. Some are reporting that when you login to your AdWords account and click on the tools drop down and select the keyword tool, Google won't take you to the keyword tool. Instead of Google taking you to the keyword tool, Google is taking you to the new keyword planner tool. As you can imagine, this can be frustrating for advertisers and also scary. It might be a sign that Google may replace the keyword tool with the planner tool? Personally, logged in or out, the keyword tool works and does not redirect me to the planner tool. I am not sure if this is a sign that the keyword tool will be replaced by the keyword planner or if this is a weird bug upsetting a subset of advertisers?